Today we have a .txtLAB sponsored talk on the history of science. 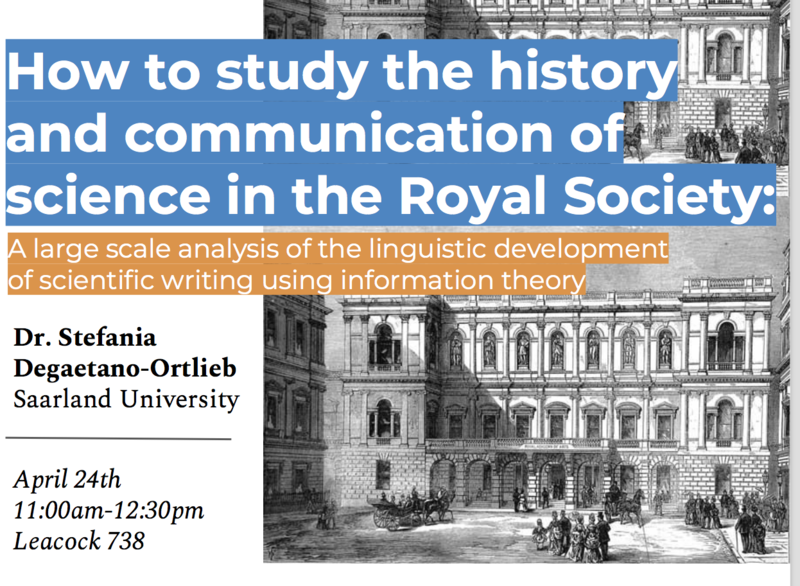 Our visiting speaker is Dr. Stefania Degaetano-Ortlieb, who is a postdoctoral researcher at the University of Saarland in Germany and affiliated with the Collaborative Research Centre on Information Density and Linguistic Encoding. Her work represents an extremely important bridge between the field of computational linguistics and what we now call cultural analytics, or the study of cultural practices at large scale. Her research focuses in particular on using the tools of data science to study the history and present of scientific communication. Communication of scientific knowledge in written form has a longstanding tradition starting with the first world’s scientific journal Philosophical Transactions of the Royal Society in 1665 published by the visionary editorship of Henry Oldenburg. While the function remained essentially the same, namely to inform the scientific community of the latest discoveries, the journal has undergone significant change over time. We focus on socio-linguistic changes driven by the overarching hypothesis that the linguistic development of scientific writing is characterized by mechanisms of specialization and conventionalization serving to optimize efficiency in communication. To capture this optimization process in our Collaborative Research Center we developed a new approach based on information-theoretic measures, which supports studying variation in language use on a large scale.